Thank you to Tim LaBaron, Deputy Director for Regional Operations at NTSB for speaking to our GHS students! 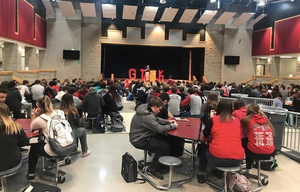 We are excited to announce that Tim LaBaron, Deputy Director for Regional Operations at NTSB, visited and spoke to our GHS students on Wednesday, March 13, 2019. Mr. LaBaron was the lead investigator on the 747 cargo plane crash in Afghanistan in 2013. You may have seen the ominous dash-cam video of the crash that went viral. Afghan Nightmare (Episode 10 - Season 10 of Air Disasters) is a 44 min documentary outlining the investigation. Mr. LaBaron spoke to juniors and seniors outlining the personal struggles he faced on his journey towards success. He shared some lessons he learned that helped him achieve his goals. During 6th and 7th bells, Mr. LaBaron conducted a more technical presentation regarding his investigation in Afghanistan. 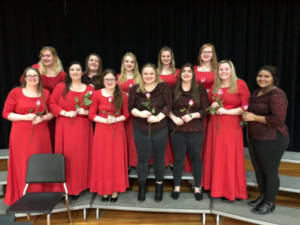 Take a moment to check out the GHS newsletter for the week of March 18th, 2019! Take a moment to check out the GHS newsletter for the week of March 18th, 2019. Have a wonderful weekend! Great night of GMS talent displayed at our GLS Fine Arts Festival! Great night of GMS talent displayed at our GLS Fine Arts Festival. Awesome displays of art from our 6th,7th & 8th grade students. Followed by our GMS Choirs. Big THANK YOU to Mrs. Mink our Art teacher along with Mrs. Hanford & Mrs. Petty for leading our choir. As always THANK YOU parents, friends and community for coming and supporting!! Preschool Information Night at Marr/Cook on Tuesday, March 19th at 7 PM! Mark your calendars! Preschool Information Night is one week from today! See you at Marr/Cook on Tuesday, March 19th at 7 PM. GHS Newsletter for the week of April 1st! 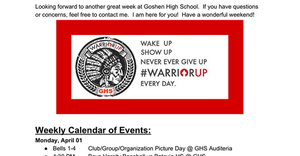 Take a moment to check out the GHS Newsletter for the week of April 1st. We look forward to seeing everyone on Monday! Congratulations to Goshen High School's Kayla Tuerck! 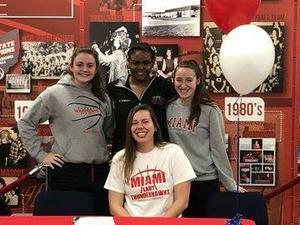 Congratulations to Goshen High School's Kayla Tuerck for signing her Letter in Intent to play basketball at Miami Middletown next year. Congrats Kayla! Amazing Evening at Goshen Fine Arts Night! What an amazing evening for Goshen High School students to showcase their talents at the Goshen Fine Arts Night. Could not be more proud of our fantastic students! Goshen Local Schools Spring Break, March 23rd - 30th! Goshen Local Schools Spring Break will be March 23rd - 30th! Spaulding 5th graders have been working on a national drawing competition! Awesome displays of art from our 6th, 7th & 8th grade students!